Well, thanks to my wheedling my friends on Facebook to get me to update, I am finally writing a new entry. Sorry it's been three months. It's not that there hasn't been anything to report on, I think I kept looking back at my previous entry, giggling with glee, and feeling freshly content (or perhaps slightly intimidated) with my writing. But that's not the point of a blog! The point of a blog, clearly, is to show what's been going on in my life in the best possible witty light, to give myself an inflated ego in years to come. So far it's worked marvelously. Anyways, here are some topics requested for clarification from my darling readers. Anyone can breathe fire here! We went to Kagoshima, not just for sightseeing, but to see if the rumors that the volcano Sakurajima erupted once a day were true. As it turns out, they were false. Sakurajima erupted at least once every ten minutes! By erupted, I mean , it spewed out impressive towering clouds of ash, sometimes so large the ashes covered the entire peninsula, coating cars and making hanging laundry outside near impossible. But for all that, no-one seemed particularly impressed by the displays. "Hm," the people around us on the ferry would say, looking at the potential cloud of doom spurting out of the volcano, and then they would go back to playing on their phones. 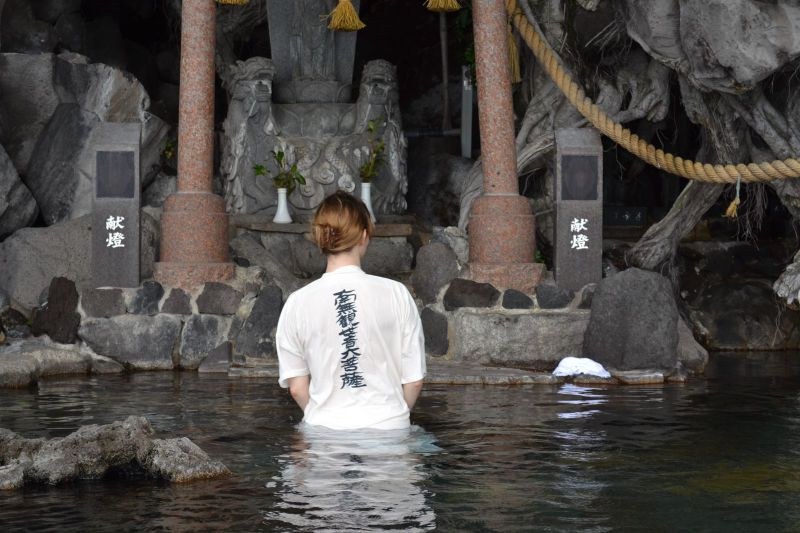 c. if you are only imagining that your robe is floating up in the water, giving the other onsen-goers an extra show. d. if perhaps that is your smiting. The previous president of the company, the one who fostered it from a tiny startup to a good-sized company with nearly a hundred employees, decided he had done his duty and sold the company off to Perfect World International, a Chinese company run from Beijing. Perfect World is doing really well, but a lot of middle managers didn't like the new management style (which is more american than japanese), and followed the president to his new venture company. This desertion of about 70% of the middle managers left daily operations confused and shaken, just at a time when interest in the current games were at a slump and we needed to find a new hit game to import and market. But, no middle managers means we can do whatever we want, right? No no. it means you can't do *anything* because you can't get approval. Finally, after a month of suffering, we got new managers, who were ... well, challenged in the decision making department. Their bright ideas included firing expensive people who knew what they were doing and hiring the cheapest unexperienced workers possible. My friends were being fired or quitting, and it was really not a fun place to work at anymore. All of March, the cold dark drizzly month, I was secretly firing off emails and attending interviews (when I didn't have the flu. Jobhunting and the flu is not a good mix!)... and finally, I found my new company... dum dum dum: Rakuten! Raku - who? You may ask. They are a giant online marketplace, with a unique business model of supporting merchants and helping them set up and run online shops. Due to this business model, it's hard to directly compare prices on products: think of it as a physical shopping mall with lots of stores that might have the same product. You have to go into the store to find the price, and in the end if you find a price that looks reasonable, you'll take it. ...or I guess you might go to Amazon ;p . But I like that this model supports the mom & pop shops, some of which only exist on Rakuten. They're becoming a very international company, just made huge investments in Pinterest, they own Buy.com in LA, Linkshare in San Francisco, PriceMinster in France... and Kobo in Canada! They released a Japanese version of the Kobo touch e-reader here and it's very cool, we all got free devices and to play with. Thanks Shacho! Another plus is, as a company they are very foreigner friendly. (but you really need to speak Japanese to work there, no matter what the insist in the interview about English being the official language ;)). Anyways, I'm doing front-end programming on stuff like bookmarks and wishlists. I like my team (the guy to my left is from Hokkaido, and on the right, from India). It's the first time I felt old though. They're both in their early 20's. I remember being that age.... (thousand yard stare of nostalgic flashbacks). This sounded tempting. As we both have white-collar jobs and live in an apartment with no yard, working a field once a month sounded almost romantic. In the end she convinced us, and we got a book on gardening that had lots of color pictures and a ranking chart of the difficulty of various vegetables. (Spoiler alert: We only chose the easiest). 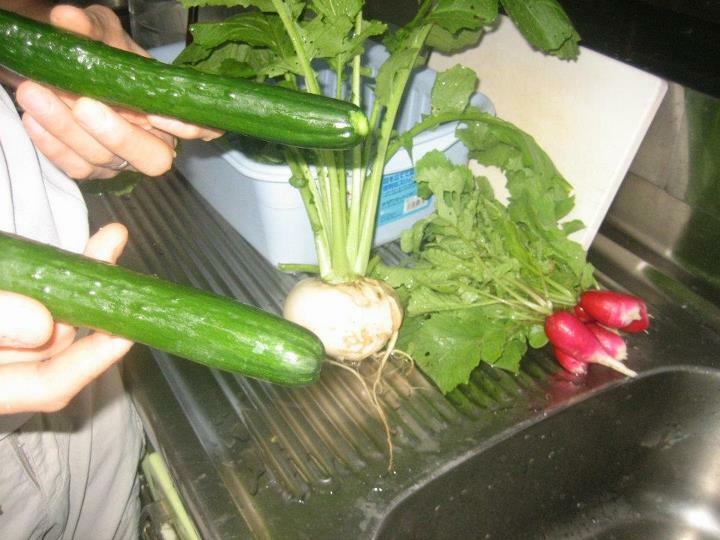 * veggies from sprouts grow much better than veggies from seeds. * herbs planted from seeds in the vegetable garden do not grow AT ALL. * the expensive corn seeds were dyed red for some reason, but they were super strong and all grew perfectly. * grandma thinks that orangey-green tomatoes, soft small pumpkins, and miniscule eggplants are ripe and need to be picked straight away and placed in the refrigerator. Or sometimes the freezer. We only found a few tomatoes that had escaped her hands. (T_T) It's a little hard to ask her not to, because a. it's her damn yard and b. she's pretty much deaf. *bug nets only work when placed at the time of planting. For instance, lettuce with will not be helped much if you place the bug net over them *AFTER* they already have bugs on them. You're just trapping the bugs in a delicious food nest. This probably should have been obvious. ;) Note to self: try wrapping the net around the tomatoes next year as a grandma deterrent. *I do not know how to cook zucchini. So, overall quite the succesful crop! Thanks for reading, and thanks for the pokes. Viet, you owe me a comment. * 'survival camping' in Izu - we're planning to bring rice and a tent, and only eat the fish we catch during the three-day weekend in September. See if we survive our attempt at bad-assery. 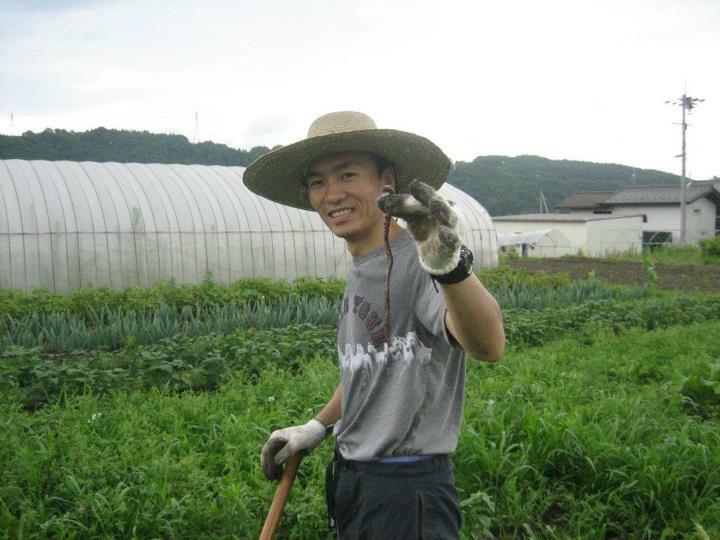 Looks like you and Takeshi are having tons of fun. Maybe one day I'll get to visit you again! I was always pretty sure that gardening is not economically viable for people who don't know what they are doing. I do want to try to put something out on our balcony anyway though. just think of it as a hobby, not an investment. As long as it's fun, no big deal ;) any veggies you get out of it are a bonus! I can't get over the coolness of the photo of you exhaling smoke like a dragon. You look like you have powers. 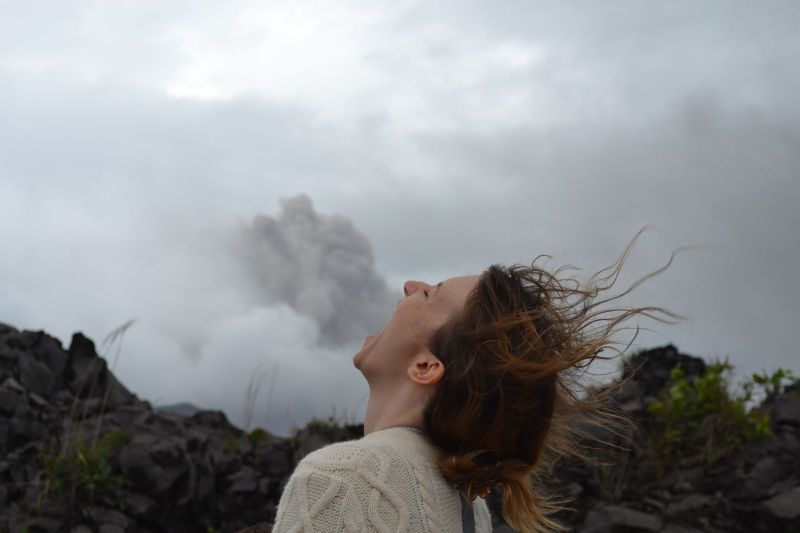 Is your hair being blown back by the force of the volcano eruption? Or is that just your powers? I have always been envious of Japanese farmers, and often drempt of finding my own plot of land. The expensive corn seed is painted with an innoculant against disease. ~You can do a similar thing to legumes (beans) with special bacteria that come in packets, to facilitate nitrogen fixation. Seeing the nice radish photos, I'd recommend trying to find 'golden' beet seeds to plant next year. I'd bet they'd do well, and they're simply delicious.